The Galileo educator site offers educators and students interesting facts about NASA's Galileo mission to Jupiter and Europa, and many classroom activities. There are activities to interpret new images of new worlds, planets and satellites, navigating the solar system, planetary surfaces, a closer look of Europa, design a spacecraft to test for life on Europa, building a scale model of the Galileo spacecraft out of paper. Links are provided to images taken during the Galileo flight to Jupiter including images of Earth, the Moon, Venus, asteroids, and the Comet Shoemaker-Levy 9 Impact with Jupiter. 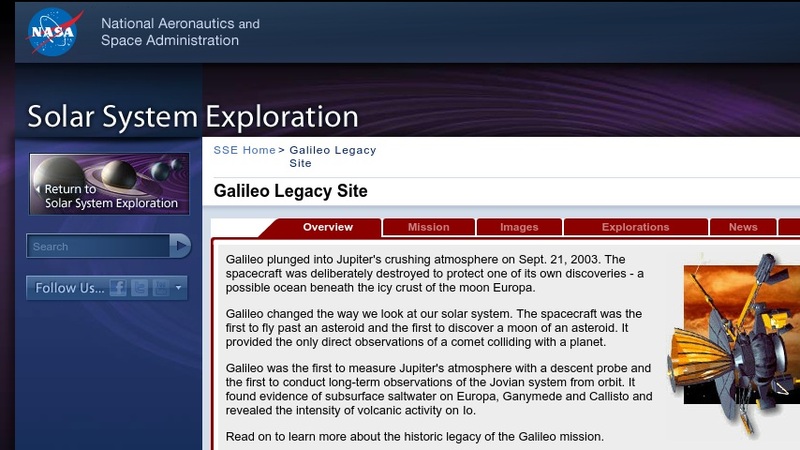 Additional resources include summaries of symposiums about water and life in the solar system for educators, downloadable posters and images for bulletin boards, a description of the flight of Galileo from Earth to Jupiter, a brief history about the scientist Galileo Galilei, and biographies about the engineers and scientists working on the Galileo mission.